Foreword – Extinct Birds by Errol Fuller for the HBW. The Great Auk is an extinct species and the only recent flightless Alcidae with typical black upperparts and white underparts. Its closest living relative is the Razorbill (Alca torda), confirmed by DNA analysis, but also morphological and biogeographical studies. The Great Auk occupied boreal latitudes across the Northern Atlantic, leaving the oceans for land only for breeding on remote rocky islands with sloping shorelines, providing easier access to and from the sea. The nesting sites were usually close to rich feeding areas, but far enough from mainland to avoid both humans and polar bears. The Great Auk was totally vulnerable to predators such as the ruthless and inventive humans. The birds were driven back from their most accessible breeding islands, and were forced back into more remote areas. In the early 18th century, they bred only on few islands where it was difficult to land for these clumsy birds. The Great Auk established its colonies on other islands, but easily accessible to the hungry sailors who feasted on these animals, eating them and taking down and feathers, but also oil for various uses. By the late 18th century, the Great Auk bred only on some islands off Iceland coasts. But their main breeding island, Geirfuglasker (Great Auk Island or Rock) disappeared following a submarine volcanic explosion during the winter of 1830. The remaining Great Auks finally reached the island of Eldey (Iceland) with difficult access for them. However, humans performed the first raid upon this island and took 24 birds. A year later, 13 were obtained and the following raids took more birds, until July of 1844, when the two last Great Auks, a pair, were killed on Eldey Island. The adults were strangled while the single egg was smashed with the boot of the killer. Any Great Auk was ever seen again. The Great Auk in breeding plumage had black upperparts including head, throat, wings and tail. The underparts were white on breast, belly and undertail-coverts. The wings had a white trailing edge, even visible on closed wings. On the head, there was a large white area in front of each eye. The large, robust bill was black and ridged on both mandibles. The gape was bright yellow. The eyes were brown. The strong legs and large webbed feet were black and placed far back on body. The Great Auk in non-breeding plumage lost the white eye patch. It was replaced by a broad, white band and a grey row of feathers extending from the eye to the ear. Head and throat were largely white except on central crown and nape, and around the bill base. Male and female were similar in plumage, with probably small difference in size. The chick had grey down. The juvenile had less ridged bill. The black neck was mottled white. The white eye area was absent, but it had a grey eye line extending to below the ears. The Great Auk bred on offshore islands in the N Atlantic. They occurred from Canada, Greenland and Iceland to the British Islands and Scandinavia, France and N Spain. After breeding, it migrated away from the colonies, and reached southern regions in late autumn and winter, to the Grand Banks of Newfoundland. Bones have been found as far as Florida, but usually, its southernmost range was Massachusetts Bay in winter. The Great Auk bred on rocky islands with gentle slopes to the sea for better access. The foraging areas were in the open ocean in cold waters. The Great Auk produced low croaking and hoarse scream, with a voice generally louder and deeper than that of the Razorbill . These birds also used visual displays to communicate. The Great Auk was a highly specialized piscivore. The usual prey was fish of 140/190 mm long, after examination of bill measurements. It probably fed in shallow waters up to 18 metres depth, and relatively close to the shore, within 2 kilometres. It favoured fish with high fat content. But from another examination of the food content of birds collected in SW Greenland, the prey included Myoxocephalus Scorpius and Cyclopterus lumpus that are bottom-dwelling fish species. It foraged on benthic fish prey in waters of 75 metres in depth or less, but it was able to dive at greater depths, propelled by its short, powerful wings. Actually, the Great Auk was able to adapt its foraging behaviour to the local food resources. The Great Auk was gregarious, foraging in small groups and breeding in colonies. 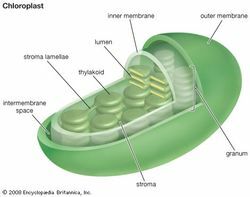 Both mates were monogamous, usually with long-term pair-bonds. It was suggested that visual displays with head shacking and bowing as courtship displays were performed to enhance the black-and-white head pattern and the bright yellow gape. Once paired, the copulation occurred on the nest-site, at base of cliffs in the colony. The Great Auk left the breeding islands after the nesting period in late August/September, and returned to the nesting sites in early spring. The Great Auk was flightless but it was a very good diver and swimmer. 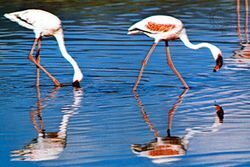 It was clumsy on land while walking with an upright posture, because its legs were placed far back on body. 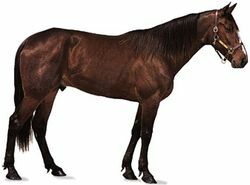 The breeding season occurred from May to June/August. The Great Auk bred in colonies established on remote rocky islands. The colonies were dense with the pairs close to each other. The female laid a single elongated egg directly on the bare ground. Both adults shared the incubation during 39-44 days with turns. The chick hatched in June or later. The downy chick was grey. It was fed by both parents. It left the nest-site only 2-3 weeks after hatching, and reached the sea in mid-July. It was still dependent on parents for food. It was sexually mature at 4-7 years old. 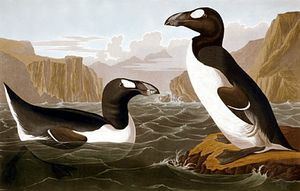 The Great Auk is extinct since 1844, and excessive hunting was the main cause of the extinction, although there was a possibility that population and range were declining due to environment changes and weather conditions, involving the reduction of food availability and lack of suitable islands for nesting. Numerous skins (78) of the Great Auk are in museum collections, along with about 75 eggs and 24 complete skeletons. There are only remains, but the Great Auk is today definitively extinct with the two last live birds seen on 3 July 1844. They had been killed by strangulation for a merchant who asked for skins, and the single egg was smashed with the boot of the killer. Great auk, (Pinguinus impennis), also called garefowl, flightless seabird extinct since 1844. 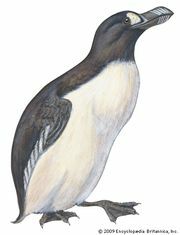 Great auks belonged to the family Alcidae (order Charadriiformes). They bred in colonies on rocky islands off North Atlantic coasts (St. Kilda, the Faroe Islands , Iceland, and Funk Island off Newfoundland); subfossil remains have been found as far south as Florida , Spain, and Italy. The body of the great auk was approximately 75 cm (30 inches) long; the wings, which were used in swimming underwater, were less than 15 cm long. The large black bill bore eight or more transverse grooves. The bird stood erect on land. It had a black back and head, a white front, and a large white spot between the bill and eye. Utterly defenseless, great auks were killed by rapacious hunters for food and bait, particularly during the early 1800s. Enormous numbers were captured, the birds often being driven up a plank and slaughtered on their way into the hold of a vessel. The last known specimens were killed in June 1844 at Eldey island, Iceland. About 80 great auks and a like number of their eggs are preserved in museums. The nearest living relatives are the razor-billed auks , about 40 cm long.